We’re pleased to announce that Fieldoo is rapidly becoming the ultimate destination for football players (and soon for agents as well); for those who want to boost their career, showcase their skills or simply make for themselves an unforgettable football life. But while you’ve told us you’ve enjoyed seeing what we have to offer, we’ve also heard loud and clear that there were some features we could add or improve on. Want to be connected with teammates or players from around the world? Just click “Follow” button (on their renewed profile below the profile image) and you will instantly start following (track) players you choose; they’ll be instantly added to your connection page (see screenshot below). There’s more to come: activity stream, where you’ll be able to follow your connections’ actions (match updates, their new connections…) directly from your dashboard. The system of connections is simple (à la Twitter): you can follow other players and they can follow you back. It’s not mandatory to be connected both ways. Maybe someone is interested in you and you don’t know him, but why should we disable him an option to follow you? You should be proud and happy to have followers/people who are interested in you (see below new menu with connections and message inbox on the top of private profile). Do you want to ask a player something about his performance, his team or transfer opportunities? No problem, just send him a message! You have the history of messages (new ones marked with green dot) in your inbox (see below). Messages are directly accessible from the top menu of your profile (new messages and their number is marked with green; see above). 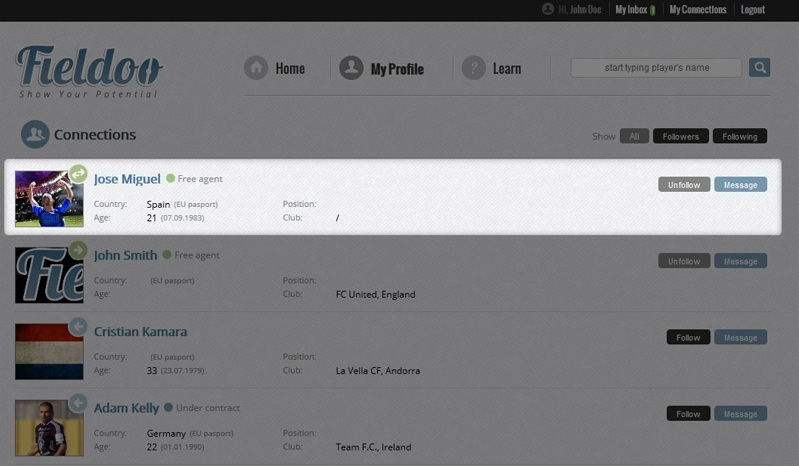 You can send messages from the inbox, from player’s profile (next to the “follow” button on their renewed profile below the profile image) or connections page (see message button above). However, the idea is not to overreact with messages: send reasonable number of messages; don’t spam and don’t be annoying. 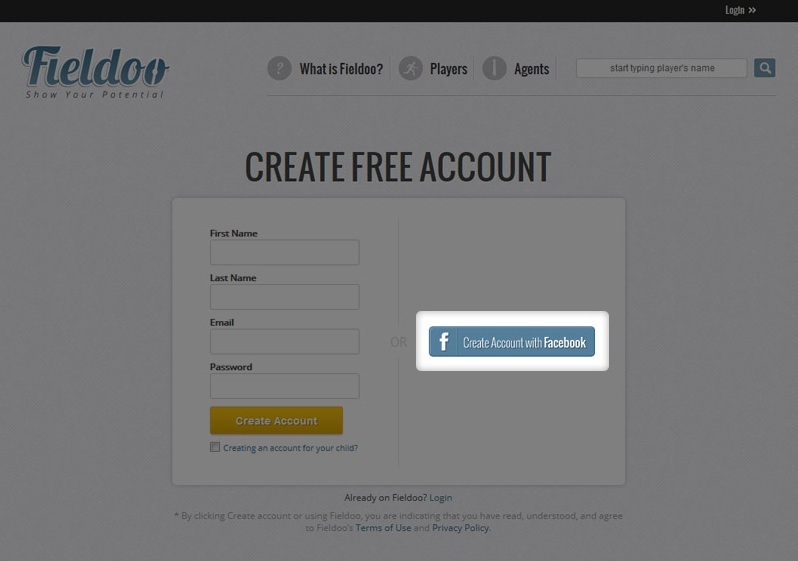 It’s easier than ever to a create Fieldoo account using Facebook! All you need to do is choose “Create account with Facebook” button (below) and your profile will be made in a moment (once you accept the app’s requirements within Facebook). Consequently, you can always login to Fieldoo with Facebook. However, here are few important things you should know. If you already have a Fieldoo account, and you want to login with Facebook, be sure you use the same email for Fieldoo and Facebook. If you have different emails and you want to login with Facebook, the best solution is to change your Fieldoo email into the same you have on Facebook (click Edit profile > change email on the left – make sure it’s the same as Facebook email > click Save). Football is a team game and there’s no better thing to hang out on Fieldoo with other players – team spirit counts! 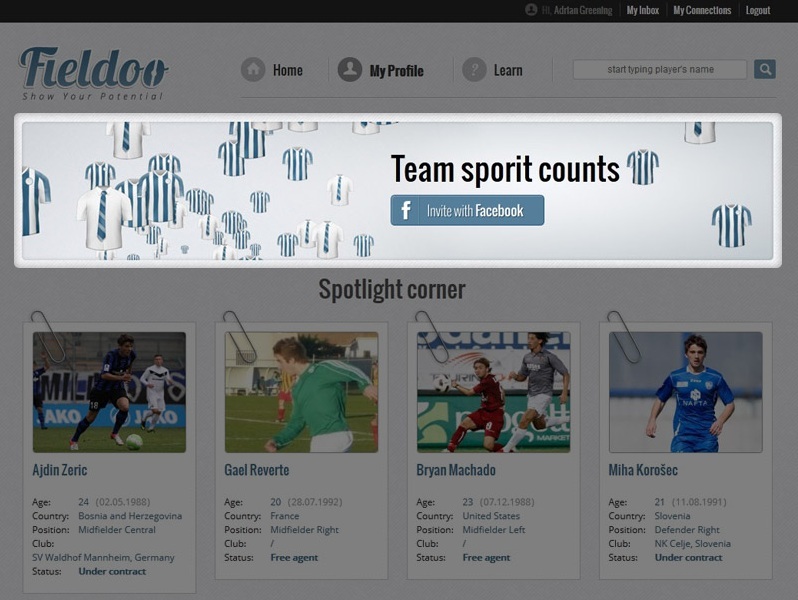 Invite your Facebook friends (football players) to join Fieldoo. It’s easy: click “Invite with Facebook” button (private profile or registrated home; see below) and make an action. Once he joins Fieldoo you will automatically be connected (he will follow you & you will follow him). 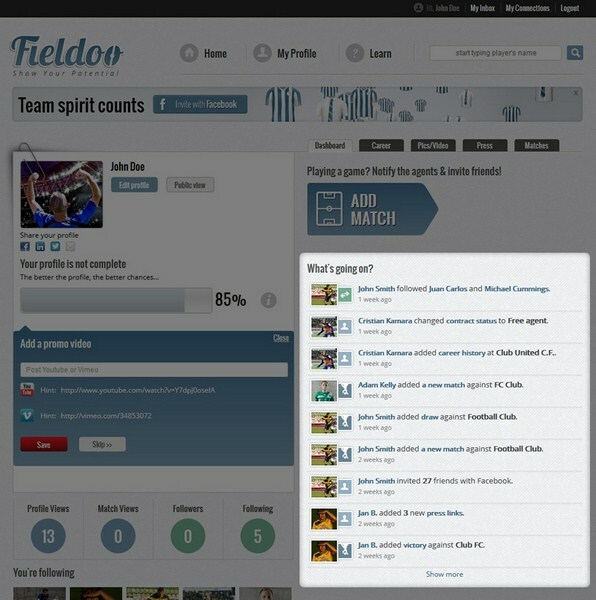 With more players and friends on Fieldoo, your social experience will absolutely get better. There’s another fresh thing. Now you can check your popularity and see how many people saw your public profile and your matches (you also see the number of the people you follow and are following you; below). Those numbers are extremely important as they are raising your value and help you get more exposed. Furthermore, the number of public views gives you better options to be spotlighted by Fieldoo on the front page, which again drives more traffic and publicity to you. How to grow your popularity? A lot depends on you. Share your profile with others through Facebook, Twitter… everything or everybody can help you in your career! One more tip: if you don’t have current matches to update (you’re free agent without club), we recommend you to enter at least 5 last matches you played. That shows your last performance; even though it was a year ago. 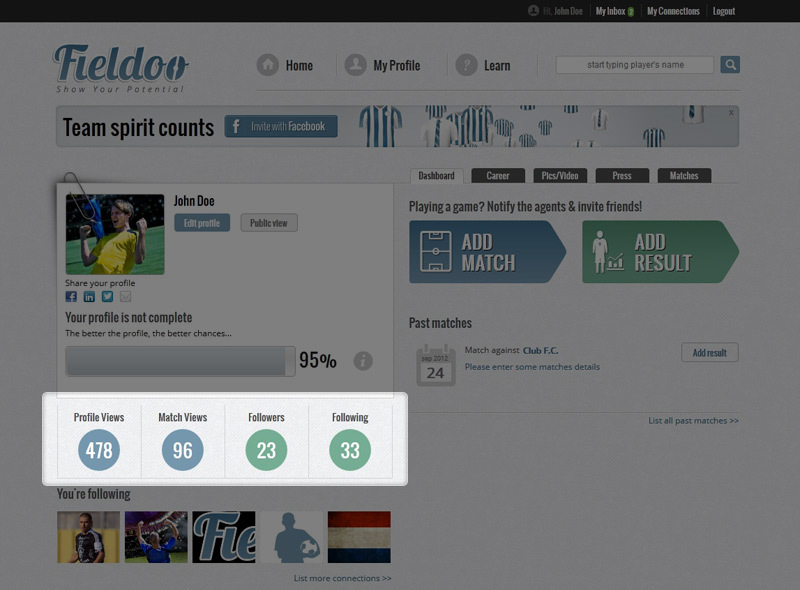 The latest update we made is news feed (below) in your profile, where you can see all the important things by the players you follow on Fieldoo: profile updates, upcoming/past matches and their connections with other Fieldoo members. The news feed may be helpful, because you can see what other players are doing on Fieldoo, who are the people they connect with (they might be interesting for you as well) and how are they performing. Who to follow and see his news? Your current or ex-teammates, opponents, players from your country or same league, players you look up to… it all depends of your interests. Hope you like the latest updates! Login or Create a FREE account and try them. We’ll be more than happy to hear from you what you think of them in our feedback section. Cheers!